The day that a group of missionaries delivered their message of improving the quality of life for children living in draught-stricken Eastern Guatemala at my rural Wisconsin church I must have been especially tired and weary. I can remember being brought to tears almost instantly as the founder described the long-term famine in the region and the children who were starving and neglected. I cried sobs almost uncontrollably, the white hot tears streaming down my face. My husband looked at me and knew we would somehow get involved. I had to be there. I had to see those children. I had to do something. I was wrecked by those images and I had to do something about it. We signed up to sponsor a child that day and I signed my name on the line to go to Guatemala on a trip I knew or understood very little about. During the time I prepared for the trip I kept asking myself, “Am I a missionary?” “What is my purpose with this?” When I finally boarded the plane to Guatemala City three months later with my group of missionaries, I settled in and tried to get to know the people I was with, most of whom I had only met once or twice and did not know intimately at all. I would be bunking with my Pastor’s wife, our Associate Pastor, and one of the Elders from the church. I wondered how I ended up in such close proximity to leaders in the church. I was just someone who sat in the pews and struggled with the whole idea that Jesus died for my sins. I would often wonder why I didn’t have that gift of faith, that steadfast belief that Jesus died on a cross, was resurrected into heaven and offered me eternal salvation if I held that belief. The thing is that I was never quite sure it was the afterlife that I needed salvation from as much as my life here, now, on Earth. From Guatemala City and its pristine international airport we traveled to Chiquimula where our clean but spare hostel was based and then headed out for day trips that would launch out of a town called Jocatan. Our trips out of Jocatan into the mountain villages were harrowing by American standards. Standing in the back of pickup trucks as they zoom down the highway and then head off-road pitching from side to side from the ruts and valleys of ancient footpaths into the remote reaches of the region not far from the border of Honduras is an experience you can’t really be prepared for. Unless, I suppose, you are a National Geographic photographer who lives on the edges of the third world for a living. So by the time we reached the beautiful old church where we would spend our first day in the field I was travel worn and overstimulated. It had been a long time since I had experienced travel that wasn’t draped in the luxury of western, upper-middle class standards. I don’t know what I had expected to encounter but each step took me farther from the ease of my life at home. The main purpose of our work was to support the medical mission of our nurses, health technicians and the local doctor who came to volunteer with us. The medical team set up a triage where they would examine people who came through for any visible signs of distress, to take vitals and to administer anti-parasitic medicines to everyone who walked through the door. Parasites run rampant through communities in remote villages because of the lack of sanitized water. Because of this many children are robbed of the nutrients their bodies need from the little food they have and become malnourished. The children were administered these yucky-tasting chalky pills from the most endearing, tender hearted people I have ever known. We were asked to volunteer for our positions prior to the distribution but the thought of approaching mothers with their children strapped on their waists terrified me. Up close and personal is not the type of volunteer work I normally engage in. It was more than enough for me to stand behind table and dole out t-shirts and trousers as people waited in line for the health care they needed so desperately. Initially, the experience of driving into the villages through the thick, dry [word?] didn’t feel right to me. These are areas which are only known to the local populations and I felt as if I were in a fishbowl riding in the caravan of pickup trucks full of white missionaries. People stared at us out of their houses and children followed the trucks, running to catch the candy that was being thrown to them. What were we doing there? Why were we bringing used Green Bay Packers t-shirts to people who were so colorfully and meticulously clothed? The women and girls wore dresses that were spectacular in their enthusiastic combinations of blues, reds, yellows and greens. The hand sewn dresses were modest and pretty with pleats and puffs. The men were dapperly dressed in their blue pants, cowboy boots and hats. Yes there were pants-less children running around the houses, but why was I to judge that? 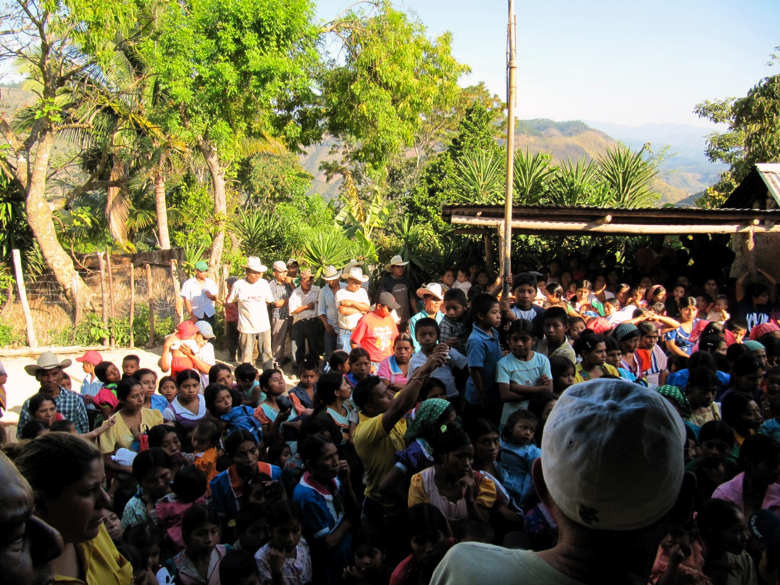 Yet, as I looked on to the faces of 800 people who had gathered for that first medical mission and distribution, I realized that I couldn’t apply my anti-imperialist notions to the daily lives of people in need. Our specialists identified life inhibiting skin disorders, blindness, worms, fungus problems, asthmas and much more. They examined pregnant women and children with boils and tumors. They handed out whatever remedies and antibiotics we had available to us. They distributed prenatal vitamins and folic acid. One of the most striking issues facing the women in the region were yeast infections that went untreated leading to long term discomfort and related problems. I took for granted being able to stop in to my local pharmacy and just buy off of the shelves a myriad remedies to make my life easier yet these remedies aren’t available in much of the world. The simplest inconveniences we face become life inhibiting obstacles elsewhere. I spent those days handing out clothing and toys and looking into the eyes of the shy and humble women who walked through my line. I coaxed smiles out of the mothers and giggles out of their babies. I noticed the line of children behind each mother, each child about a year apart and noticed how the toddlers fared the worst. Weaned from their Mother’s breast, replaced by a new sibling and not yet old enough to fend for themselves, it is these in-between children who are most susceptible to malnutrition and disease. I was instructed to identify any children with distended bellies and bulging eyes and bring these children and their families to the medical team. These families would receive supplemental nutrition on a monthly basis and become eligible to have a bucket garden installed on their property, receive chickens and citrus trees to grow their own food, and become and independent, healthy and sustainable family. Most missions teach a man to fish by providing the materials so families can have a basic subsistence life and put their attention to finding whatever work they can to enhance their standard of living. Seeing dirty children with distended bellies in a commercial and seeing a dirt poor existence on a television commercial or from afar in a tourist bus is much different than witnessing it up close. When you see people who are proud and capable yet hungry and vulnerable in the intimacy of their homes, any Western ideas about individualism and work ethic disappear. Or at least they should. There are smart and hard-working people all over the world who will never pick themselves up by the bootstraps to make a better life. There were days that made me cry rivers of tears by witnessing the love and laughter that exists among the people of Guatemala in spite of the hardships of their village life. Families may have no food in the house but they do not beg, they do not appear weary, they do not appear forlorn. Instead, their children laughed and are loved and their eyes twinkle with the delights of being children. They played and took care of each other. They were proud and somewhat suspicious of our group of white missionaries. All around us there was happiness amidst the aching poverty and even amidst the family dramas that played out in the paternalistic cultural we could not really understand. My orientation and understanding of the world and its people were deeply and meaningfully impacted by my missionary week in Guatemala. But all along Orion was in the sky and the Moon was bright and I was comforted knowing my family might be looking up at the same sights. Now I realize the whole world looks up too. Kristine Sperling is a believer, wife, mother, writer, entrepreneur and recovered attorney who lives with her family in Westport, Wisconsin. This entry was posted in Guest writer and tagged guatemala, mission, travel. Bookmark the permalink.